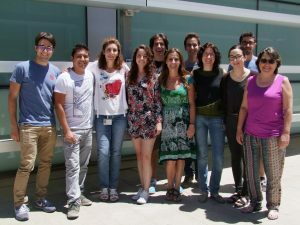 The Genomic of Gene Expression Lab, lead by Ana Conesa, is a multidisciplinary team interested in the development of computational approaches to study functional aspects of gene expression and omics data. We work extensively in the data integration from different types of NGS-based technologies and create algorithms and software for the scientific community. Some examples are Blast2GO, Paintomics, maSigPro, NOISeq, etc. We are looking for talented and motivated researchers to join our team within a recently funded project of the Ministry of Economy and Competitiveness. The project aims to investigate novel regulatory and functional aspects of alternative transcript isoforms using computational methods and third generation genomics data, such as long-read sequencing technologies, multi- omics datasets and single-cell genomics experiments. In addition, we seek an informatics technician to support the computational and software infrastructure of the lab. Are you our candidate? PhD candidates should have a Master in Biotechnology, Bioinformatics or similar, while Post-docs should have completed a PhD in Bioinformatics or Biostatistics. Experience with the modeling of protein-protein interactions and/or signaling & metabolic pathways will be highly valued. Candidates should have a good knowledge of Genetics and Molecular Biology, be skillful in programming (R, Python or Java) and fluent in English. For the Technician position we require a degree in computer science and experience with high performance computing applications. What do we offer? A 4 year PhD, 2 year Postdoc and 1+ year Technician contract within an excellent environment for scientific development, that includes an international multidisciplinary team, dry and wet lab resources for method development and validation, and different options for short training periods at European and US labs. Tentative start date: between October 2016 and January 2017. Are you interested? Send your CV before 1st of August 2016, together with a motivation letter and 2 recommendation letters, or any question you may have to Ana Conesa aconesa@cipf.es.